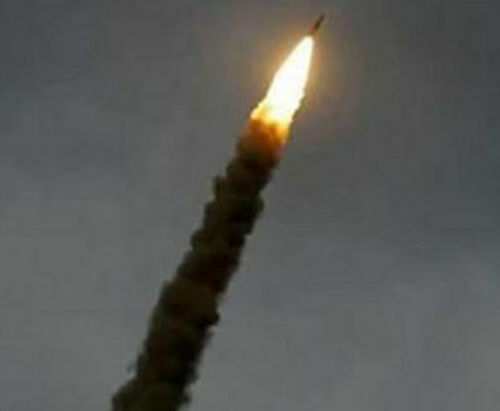 Russia touted Thursday a new hypersonic missile said to hit speeds of more than 30,000 kilometres per hour, amid heightened tension with the US over arms control. Russian President Vladimir Putin on Wednesday tracked final tests of a hypersonic missile dubbed "Avangard," which he says would defeat all existing missile defence systems. When Putin unveiled the new weapon during his state of the nation address in March, he said the missile was highly manoeuvrable and flew at 20 times the speed of sound. Senior officials now say the intercontinental projectile is considerably faster. "During tests, Avangard reached the speed of Mach 27," or roughly 33,000 kilometres (20,500 miles) per hour, Deputy Prime Minister Yury Borisov said in televised remarks. Mach 1 is a unit of measurement equivalent to the speed of sound. "At this speed not a single intercepter missile can shoot it down," Borisov said. He also claimed it was impossible to predict the missile's movements, which meant "missile defence is practically rendered obsolete." Putin termed the final test an "absolute success," and said Avangard would be deployed next year. The Bell, an independent media outlet, said Putin was so excited about Wednesday's tests that he told Russian businessmen about them later in the day and said that no one could threaten Russia now because it has such advanced weapons. Last week Putin laid out plans for Moscow to develop mid-range missiles banned under a Cold War treaty with the United States if Washington abandons the Intermediate-Range Nuclear Forces treaty (INF). The bilateral agreement forbids ground-launched short- and intermediate-range missiles, but not those launched from the air or sea. Putin said that seaborne Kalibr and air-launched Kh-101 cruise missiles -- and another hypersonic missile dubbed Kinzhal (Dagger) -- would be adapted for ground launch if Washington ditched the INF treaty. Russia and the US have accused each other of violating the agreement.